Released quarterly each issue of One Thimble includes PDF sewing patterns for projects that you can make and sell, as well as general sewing articles, tutorials on sewing techniques and tips for those running a handmade business. Between issues you can join the fun in our facebook group sharing your sewing and getting the advice and encouragement you need to help your sewing soar! One Thimble’s passion is inspiring confidence in enthusiastic home sewists—whether you’re sewing purely for fun or to make some money. When you have confidence in your skills and ideas, you bring your own style and twist to every pattern you sew. All patterns in this issue can be brought seperately on One Thimbles site. Click the image below to take a peek inside. There is nothing like Tickle Day when a copy of this amazing magazine lands in your letter box. The newest issue, Cocoon, is availabe now. You can by your fave copy in print or as a digital download. There are always great subscription offers and you can also pay-as-you-go. My fave issue to date but I may be a tad bias. Ginger Rose Designs has created some amazing dresses using both the Adele and Laila patterns. Buy you own copy of Tickle the Imagination Here. The dresses were created by the talented designer from Ginger Rose Design. The amazing photos were taken by Jackie Hewett Photography. Images from One Thimble magazine. 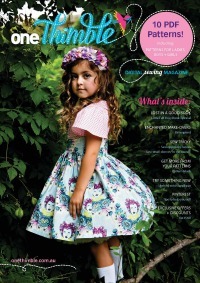 Issue 6 of One Thimble is so super special to me because the Hannah Dress was featured on the cover. How seriously fab is that? We were asked by Jen to create our samples using a chosen fabric line and I have to say I was at a bit of a loss. If you know me, you know I am a floral and roses kinda a gal, so I struggled with this one. I have to say though, the finished dress looks so beautiful on. All thanks to one amazing friend and her gorgeous little lady. 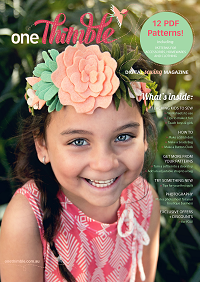 The great thing about this magazie is that it is made for handmade people by handmade people. You can also buy each sewing project as a stand alone pattern on the site.